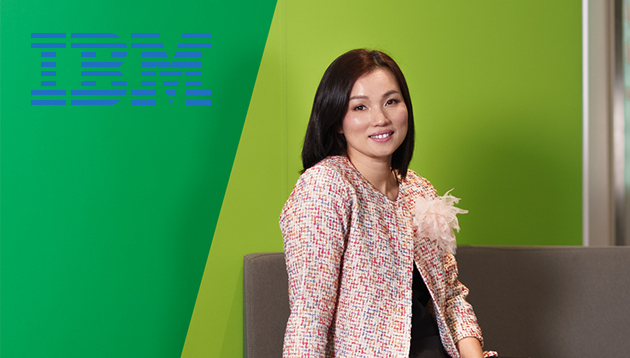 Human resources interviews Polly Tong, IBM’s head of human resources for Hong Kong, to learn how a business more than a century old continually reinvents itself to remain not only a leader in the eyes of its customers, but more importantly as one of the premier places where tech talent wants to work. Vital Stats: Polly Tong started her journey with International Business Machines Corporation (IBM) in 2000 and is the head of human resources for IBM Hong Kong and HR partner for marketing and communications function in Greater China. She is known for her vast experience in driving IBM’s transformation in Hong Kong and creating a dynamic and sustainable talent pipeline. Q What is the most recent organisational change at IBM? IBM has been transforming continually over the last 107 years. Every few years, IBM CEO will set a new vision and a transformation direction, and the department leaders will lead their teams accordingly. in high value segments and the implementation of new business models. Other than switching up our portfolio and offerings mix, we also incorporated new technologies such as artificial intelligence into our human resources operations. We are currently in the final stage where we can harvest the success of the culmination of years of hard work. Forty eight per cent of IBM’s revenue last year came from these strategic imperatives, compared with 27% in 2014. Accept and embrace the changes triggered by technology. Keep in mind that an HR leader should be a strategist, a valuable creator to one’s company and a partner to the employees. Stay curious and keep moving. We are extremely agile. Perpetual change is inevitable, especially in the tech industry. So, we embrace it by going along with it. Over the past century, we have successfully transformed our product lines from tabulators and typewriters, to services and software, to cognitive computing system IBM Watson and AI and cloud solutions. Our integrity standards have remained very high since the beginning. For instance, IBM was recently crowned by the Ethisphere Institute as one of the world’s most ethical companies. Other than that, our entire workforce is well-equipped with our set of shared values that shapes our decisions, actions and behaviours. The values are dedication to every client’s success, creating innovation that matters to our company and the world, and trust and personal responsibilities in all relationships. Q What are HR’s biggest challenges and how are you planning to alleviate them? skills, in-depth industry knowledge and strong hard skills. While we strive to motivate our employees to upskill themselves, we are also examining ways to recruit and develop new talent so we can meet the needs of IBM’s ongoing transformation. At IBM, skills matter, not degrees. Therefore, we are currently advocating a new learning model “P-Tech” (Pathways in Technology Early College High Schools) where we partner with industry experts, educators and the government to integrate STEM disciplines into high school learning by mentoring, site visits and paid internship. Equipped with all the in-demand skills, most programme graduates will skip university, move on to “new collar” jobs ranging from associate analysts to digital design developers at IBM or other industry partners. Q What trends will shape HR over the next five years? continuous learning, the Millennial and Gen Z workforce, and positive leadership management are going to shake up the current HR functions. Q What are your career goals this year? I hope to cultivate the culture of continuous learning and foster a self-motivated growth mindset; push our leadership team to move forward and lead the transformation while maintaining a positive management style; and finally, build a highly engaged workforce. Locals received an average of RM2,312 a month last year, 5.3% higher than in 2014 - with male staff earning more than females. ..